The Stairplan Budget compact loft space saver staircase offers a quality space saver for those on a tight budget. With its recessed 30mm MDF treads and Engineered Pine strings - this a robust spacesaver staircase that will last for many years. The Budget spacesaver staircase is manufactured to the highest standards with the full paddle of the tread and the risers recessed into the strings. 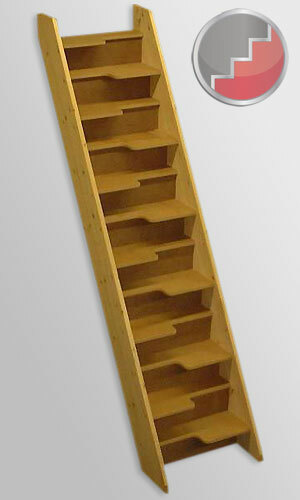 The Budget Spacesaver staircase can be manufactured in any width up to 800mm with up to 16 risers. 90° Landing Turns are available as a bespoke option and optional Traditional style balusters and handrails are available on Budget spacesaver staircase range. Specifications: 32mm Engineered Pine Strings, 30mm MDF Treads and 12mm MDF risers.